Facebook makes it easy to block people from seeing all your friends, but is there a way to hide one friend from another on Facebook? Let us go ahead and find out. In general, once you become a friend with someone on Facebook, the other person will be able to see all your friends. However, you may come across a situation where you may want to be friends with two people on Facebook without them being able to see each other in your list of Facebook friends. Such situation can arise, if these two individuals have just separated or developed serious differences between them. Unfortunately, there is no option in Facebook to prevent two people from seeing each other, while still being able see all your other Friends. Hence, we are providing below a workaround that gets the job done by preventing these two individuals from being able to see your Facebook Friends. As mentioned above, this is a workaround that hides these two individuals from each other, as both of them won’t be able to view your Facebook Friends. 1. Login to your Facebook Account on a Computer. 2. Once you are logged-in, click on your Name and then click on the Friends tab. 3. On the Friends page, click on the Pencil Icon > Edit Privacy. 4. In Edit Privacy section, click on the down arrow icon located at the top right corner of “Who can see your friends list” and click on the Custom option in the drop-down menu. 5. On the next screen, type the Names of the two individuals that you want to hide from each other in Don’t share with section. 6. 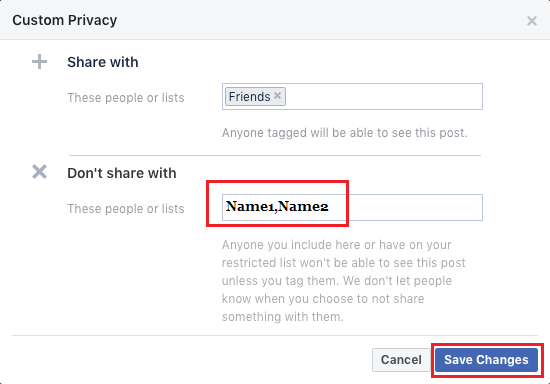 Click on Save Changes to save this setting in your Facebook Account. 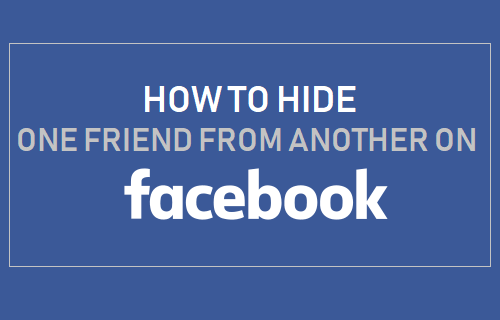 After this, both these individuals won’t be able to see your Facebook Friends and this currently is the only way to hide one friend from another on Facebook. Except for these two individuals, your other Friends will be able to see all your Friends on Facebook.